Originally starting with Ophiuchus, Natasha Tara Petrović and Ali Leriger de la Plante (as Dream Cake) are bringing their writing and art together for another project. The Curious Mystery Involving Dracula and the Wolfman follows the named characters as they attempt to find Frankenstein’s birthday gift that was stolen during an attempted murder on the Count himself! GenderTerror was able to talk to both Natasha and Ali about the project which is currently on Kickstarter. GenderTerror: Can you describe The Curious Mystery Involving Dracula and the Wolfman a bit? 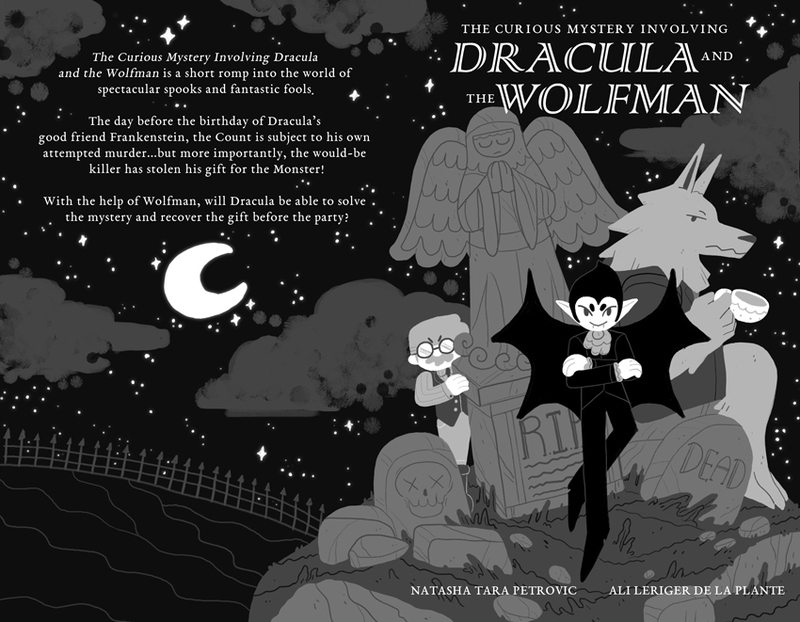 Natasha & Ali: The Curious Mystery Involving Dracula and the Wolfman is a short comic based on a short story written by Ali, and adapted to visual format by Natasha. It follows the story of Dracula, who has been stabbed and burgled by an unknown assailant. He, along with Wolfman, must track down the thief, who has stolen the gift for Frakenstein’s birthday the following day. It’s a mystery/comedy with your favourite bloodthirsty monsters. GT: Why Dracula and the Wolfman? A: Well, Natasha absolutely loves Dracula. Dracula is her favourite thing in the universe. I also like Dracula, but not nearly as much as Natasha LOVES Dracula. A: So, I was like, well, Natasha really loves Dracula, and I want more time to work on stuff between Ophiuchus and our next big project, so I’ll write a short story about Dracula for a smaller comic. Natasha will love this, I thought. N: She was right. Yeah, it’s a story that means a lot to me, because Ali wrote it, for me, specifically, so it’s been a real joy to work on. I’m getting to put characters that I enjoy separately together in a fun, spooky monster mash crossover. GT: How does horror influence your work? N: I love horror! The specific facet of that love I’m trying to showcase through this project is this: When I was a teen, I binge-watched all the classics, Dracula, Nosferatu, The Wolf Man, The Invisible Man, the Frankenstein flicks, the works. That really impressed upon me from a young age the importance of using strong dark/light values and I use that when I make my comics. I try to make everything pop. Those films also have a lot of great dramatic framing and composition, a real feast for the eyes. That’s the kind of flare and attention to detail I’m trying to capture here. The subject matter was, of course, also a great interest to me. Who doesn’t love monsters? A lot of the time they’re usually portrayed as the villains of their tales, but they’re always the most interesting feature. It’s hard not to latch onto and empathize with something you’re so invested in. A: The joke is I don’t actually super love a lot of horror…as a kid, I was too scared of the Nightmare Before Christmas to even watch it. Didn’t like Oogie Boogie. But, as an adult, I’ve come to appreciate a lot of the cinematography…but, mostly, I like the sort of theme of struggle in the face of total helplessness. I love like, Laurie Strode and Doctor Loomis from Halloween, or the Warrens in the Conjuring, who are kind of struggling against these forces of total, encompassing evil, and coming out on top. Or like, the kind of brutal revenge of a lot of monsters in those movies, punishing people for shunning their abnormality and showing the way violence can create a kind of impact crater in a community. That’s the kind of horror I like. I’m not a big fan of super nihilistic horror, haha. GT: Directed at Natasha, why do you love Dracula so much? N: I think it has a lot to do with Dracula being in the public domain? And just a widely popular character in general. The fact that Dracula — Actual Dracula- can show up in any media is ridiculously exciting to me. From Castlevania, to Scooby Doo specials, to any number of Dracula movies or comic books, he’s just so prolific. I just got attached to the many varying version of Draculas. And what’s great is the range in which he gets portrayed, from extremely goofy to very serious. That flexibility is remarkable, and admirable. It’s especially excellent because that means we can do this comic with this very silly version of Dracula, and it’s fine, and it’s actually Dracula. There’s also a ton of depth to be had if you wanna deep dive into the book, and vampire lore, super wonderful. GT: Directed at Ali, what made you change from disliking horror to coming to appreciate it? Was there a specific movie that changed your mind? A: Weirdly enough it wasn’t a movie — it was actually a video game. The first really kind of scary game I ever played was Dead Space, and at first it really freaked me out, but after a while, it kinda got to this point where I was like — well, whatever. I can just yell and stomp my way through this whole game. After that, a lot of my fear kinda went away, and I was able to start watching horror movies and stuff without being excruciatingly terrified, haha. And Natasha has made me watch so. Many. Horror movies. The exception to the rule is The Thing. I’m still terrified of The Thing, ever since I was a small child, and continue, to this day, to be terrified of The Thing. It’s the animatronics, man. They’re just too scary. GT: What is it like working together? A: It’s nice to have somebody to be second eyes on things, and who you can rely on to help you get through the dumb parts of things that you’re bad at. N: Yeah, we both have our strengths and weaknesses, and we try to cover each other in our weak areas. A: Yeah, couldn’t have said better myself. N: I feel like our individual tastes both come through very strongly in our work. Ophiuchus was our first big project, and it’s definitely a blend of weird skeleton stuff, which I like, and then cool robot stuff, which Ali likes. A: And then like, that…eat the rich kinda mentality is from both of us. That’s apparent in Ophiuchus, but not in Dracula so much, haha. N: Though Dracula does literally eat people. But not in this comic. No one gets eaten. A: But yeah. It’s nice to have somebody to work with, it helps you be generative even when you’re tuckered out. GT: How about current side projects? N: You have one of those! The other one is a small zine I’m doing called Good-Bye-Ology…which is just a series of five illustrations of robots and flowers about grief, haha. My own different five stages of grief I guess. I’ll be printing that and selling it at SPX. N: For me, my friend Ben Fleuter and I might do a horror comic thing. It’s really rough, but we have some basic ideas. I work with him on The Sword Interval as his flat colorist, and it’d be really cool for us to collaborate in a bigger way. But it’s super not really anything yet. Very up in the air. GT: Any other projects planned for the future? A: Yeah! We’re currently working on a project called Knife Witch Bullet Wizard as our next big project. It’s about teens trying to save the world, haha. The central theme is kind of like….rebuilding. Rebuilding yourself, rebuilding your relationships, rebuilding your community literally and figuratively…acknowledging the damage, letting go of unsalvageable stuff. It’s also about a witch that does all her magic with Big Knives and a wizard who controls bullets, and you guessed it, robots. N: After all this black and white work for Dracula, I’m excited to return to a very colourful world. Please support The Curious Mystery Involving Dracula and the Wolfman on Kickstarter! It ends Monday, July 30th! Natasha can be found on Twitter and 1000DeadDraculas.com. Ali can be found on Twitter and Alilart.com. Collectively, Dream Cake can be found on Twitter and Patreon.